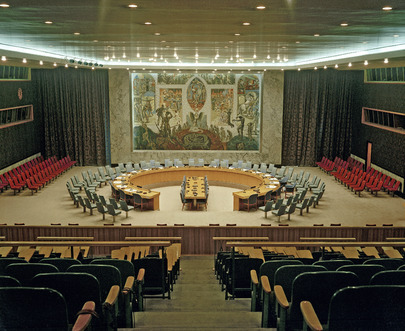 The increase in membership in the Security Council from 11 to 15, which took effect on 1 January 1966 and the growth in membership in the United Nations, made it necessary to expand the facilities to accommodate more delegates at the Council's horseshoe-shaped table and in the Chamber as a whole. The Security Council chamber was designed by a Norwegian architect, Arnstein Arneberg, and most of the furnishings are a gift from the Norwegian Government. The design used in the draperies and wall coverings shows the anchor of faith, the growing wheat of hope and the heart of charity. The mural, which was painted by Per Krohg, represents man's efforts to emerge from a dark past of war and slavery to a better life and a future illumined by science and the arts. The oval panel in the middle shows a man and woman, children around them, kneeling in calm and tranquility. The decor of the room reflects the Council's purpose: to maintain the world in a state of peace. A wide view of the Security Council Chamber.